Memory Cards & Flash Drives Data Recovery | PNY, Kingston, ScanDisk, ScanDisk Extreme, Transcend, Lexar, Sony SD card and More. Affordable SD Card Recovery– All For One Flat Fee. Protech Data Recovery offers a ONE RATE fee; $285 for any SD Card recovery service. And if we can’t recover your data for any reason, there’s no charge. No BS! We Offer the Best Affordable Choice for SD Card Recovery Services in the industry. As SD Cards get larger and cheaper, it’s getting easier to trust much more of your data to them. Unfortunately, due to their size, they are incredibly susceptible to physical damage. They can be easily bent, broken and destroyed if the user does not treat them with care. It’s also much easier to mistakenly erase data or they just stop working for no reason. And if you’re in the habit of holding on to that data for too long — for example, not transferring your photos, videos and other important data from your camera’s SD Card — disaster is almost guaranteed to strike at some point. What happens then? RTS Data Recovery is one of the leading SD Card recovery companies in the US today. We offer expert SD Card recovery services for individuals and businesses alike. We use advanced proprietary data recovery technology and techniques to recover inaccessible data from nearly all types of SD Cards, in any data loss situation. No matter what caused your PNY, Kingston, ScanDisk, ScanDisk Extreme, Transcend, Lexar, Sony SD card to fail, No matter what caused your iPad, iPad Air, iPad mini to fail, we have the required skills, experience and specialized tools to successfully recover your lost documents, music, photos, videos, contacts, messages and other important information. From accidental formatting or deletion, to water and fire damage, our SD Card data recovery specialists can retrieve damaged, inaccessible, lost data from all brand SD Cards. Often times we can recover data where other data recovery companies failed. So if your PNY, Kingston, ScanDisk, ScanDisk Extreme, Transcend, Lexar, Sony SD Card cannot be recognized or mounted on your computer, camera, smart phone or card reader, don’t panic. Most likely, your documents, photos, videos and other types of information can be recovered. Our highly trained memory SD Card data recovery team has 10+ years of hands on experience in dealing with many device failures issues. Affordable SmartMedia Recovery – All For One Flat Fee. Protech Data Recovery offers a ONE RATE fee; $285 for any SmartMedia recovery service. And if we can’t recover your data for any reason, there’s no charge. No BS! We Offer the Best Affordable Choice for SmartMedia Recovery Services in the industry. SmartMedia is a flash memory card standard owned by Toshiba, with capacities ranging from 2 MB to 128 MB. SmartMedia memory cards are no longer manufactured. 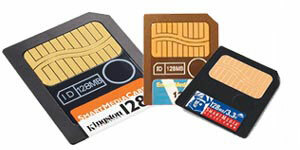 However with the development of Smart Media cards, more and more people begin to use them. There are several situations in which your files can be missing. You may mistakenly formatted the SmartMedia card when you pressed the wrong button on camera. Also, problems may occur during data transfer between the memory card and computer also. Moreover, software corruption and hardware damage put your files at risk. And if you’re in the habit of holding on to that data for too long — for example, not transferring your photos, videos and other important data from your camera’s SmartMedia card — disaster is almost guaranteed to strike at some point. What happens then? Protech Data Recovery is one of the leading SmartMedia recovery companies in the US today. We offer expert SmartMedia recovery services for individuals and businesses alike. We use advanced proprietary data recovery technology and techniques to recover inaccessible data from nearly all types of SmartMedia cards, in any data loss situation. No matter what caused your SmartMedia card to fail, we have the required skills, experience and specialized tools to successfully recover your lost documents, music, photos, videos, contacts, messages and other important information. From accidental formatting or deletion, to water and fire damage, our SmartMedia data recovery specialists can retrieve damaged, inaccessible, lost data from SmartMedia cards. Often times we can recover data where other data recovery companies failed. So if your SmartMedia card cannot be recognized or mounted on your computer, camera or card reader, don’t panic. Most likely, your photos, videos and other types of information can be recovered. Our highly trained SmartMedia card data recovery team has 10+ years of hands on experience in dealing with many device failures issues. Affordable Compact Flash Card Recovery – All For One Flat Fee. Protech Data Recovery offers a ONE RATE fee; $285 for any compact flash card recovery service. And if we can’t recover your data for any reason, there’s no charge. No BS! We Offer the Best Affordable Choice for Compact Flash Card Recovery Services in the industry. Compact Flash cards gives us convenience in digital life. As USB Thumb drives and Compact Flash cards get larger and cheaper, it’s getting easier to trust much more of your data to them. It’s also much easier to mistakenly erase data or have them just stop working on you. And if you’re in the habit of holding on to that data for too long — for example, not transferring your photos, videos, documents and important data from your USB Thumb drive or camera’s Compact Flash card — disaster is almost guaranteed to strike at some point. Accidental deletion, pressing the reformat button on your camera, or many reasons of damage (e.g. low battery power, turning off on writing/reading), this may cause you to lost your valuable pictures from a Compact Flash card. Do not worry! In most cases, they are still recoverable. Protech Data Recovery is one of the leading Compact Flash card recovery companies in the US today. We offer expert Compact Flash card recovery services for individuals and businesses alike. We use advanced proprietary data recovery technology and techniques to recover inaccessible data from nearly all types of flash memory cards, in any data loss situation. No matter what caused your Secure Digital (SD), SD Micro, Compact Flash (CF), Memory Stick (MS), MultiMediaCard (MMC), cD- Picture Card (xD), SmartMedia (SM), Microdrive, Compact Flash Card to fail, we have the required skills, experience and specialized tools to successfully recover your lost documents, music, photos, videos, contacts, messages and other important information. From accidental formatting or deletion, to water and fire damage, our Compact Flash data recovery specialists can retrieve damaged, inaccessible, lost data from Sim cards, Micro-SD cards. Often times we can recover data where other data recovery companies failed. So if your Secure Digital (SD), SD Micro, Compact Flash (CF), Memory Stick (MS), MultiMediaCard (MMC), cD- Picture Card (xD), SmartMedia (SM), Microdrives, Compact Flash Card cannot be recognized or mounted on your computer, camera, smart phone or card reader, don’t panic. Most likely, your documents, photos, videos and other types of information can be recovered. Our highly trained compact flash memory card data recovery team has 10+ years of hands on experience in dealing with many device failures issues. Affordable USB Flash Drive Recovery – All For One Flat Fee. Protech Data Recovery offers a ONE RATE fee; $285 for any USB Flash drive recovery service. And if we can’t recover your data for any reason, there’s no charge. No BS! We Offer the Best Affordable Choice for USB Flash Drive Recovery Services in the industry. The USB Flash drive is one of the most commonly used memory devices in the world. It’s the perfect way to stockpile our important data, not to mention that it is the perfect size physically to store, hide, or carry around when we need to do so. There are just so many things that can happen to them that puts our information in jeopardy. As USB Flash drives get larger and cheaper, it’s getting easier to trust much more of your data to them. It’s also much easier to mistakenly erase data or have them just stop working on you. And if you’re in the habit of holding on to that data for too long — for example, not transferring your photos, videos, documents and important data from your USB Flash drive — disaster is almost guaranteed to strike at some point. What happens then? Protech Data Recovery is one of the leading USB Flash drive recovery companies in the US today. We offer expert usb flash drive recovery services for individuals and businesses alike. We use advanced proprietary data recovery technology and techniques to recover inaccessible data from nearly all types USB Flash drive, in any data loss situation. No matter what caused your Western Digital, PNY, ScanDisk Cruzer, Kingston, Kingston Traveler, Silicon Power, Transcend JetFlash, Sony, HP Lexar USB Flash drive to fail, we have the required skills, experience and specialized tools to successfully recover your lost documents, music, photos, videos, contacts, messages and other important information. From accidental formatting or deletion, to water and fire damage, our USB Flash drive data recovery specialists can retrieve damaged, inaccessible, lost documents, music, photos, videos, contacts, messages and other important information, inaccessible, lost data from USB Flash drive. Often times we can recover data where other data recovery companies failed. So if your Western Digital, PNY, ScanDisk Cruzer, Kingston, Kingston Traveler, Silicon Power, Transcend JetFlash, Sony, HP Lexar USB Flash drive cannot be recognized or mounted on your computer, don’t panic. Most likely, your documents, photos, videos and other types of information can be recovered. Our highly trained USB Flash drive data recovery team has 10+ years of hands on experience in dealing with many device failures issues. Affordable Memory Stick Recovery – All For One Flat Fee. Protech Data Recovery offers a ONE RATE fee; $285 for any Memory Stick recovery service. And if we can’t recover your data for any reason, there’s no charge. No BS! We Offer the Best Affordable Choice for Memory Stick Recovery Services in the industry. A Memory Stick (MS) is another memory card type for digital cameras to store digital pictures. Currently, most Sony cyber-shot digital cameras use Memory Sticks. The Memory Stick was developed by Sony in 1998. There are several types of Memory Sticks including Memory Stick, Memory Stick Pro, HG, Duo and Memory Stick Micro (M2). Memory Stick can also be used in other digital devices such as Camcorders, PSPs (Play Station Portable) and mobile phones. As Memory Sticks get larger and cheaper, it’s getting easier to trust much more of your data to them. It’s also much easier to mistakenly erase data or have them just stop working on you. And if you’re in the habit of holding on to that data for too long — for example, not transferring your photos, videos, documents and important data from your mobile phone or camera’s Memory Stick — disaster is almost guaranteed to strike at some point. What happens then? Protech Data Recovery is one of the leading Memory Stick recovery companies in the US today. We offer expert Memory Stick recovery services for individuals and businesses alike. We use advanced proprietary data recovery technology and techniques to recover inaccessible data from nearly all types of Memory Sticks, in any data loss situation. No matter what caused your Memory Stick, Memory Stick Pro, HG, Duo and Memory Stick Micro (M2) to fail, we have the required skills, experience and specialized tools to successfully recover your lost documents, music, photos, videos, contacts, messages and other important information. From accidental formatting or deletion, to water and fire damage, our Memory Stick data recovery specialists can retrieve damaged, inaccessible, lost documents, music, photos, videos, contacts, messages and other important information, inaccessible, lost data from Memory Stick, Memory Stick Pro, HG, Duo and Memory Stick Micro (M2). Often times we can recover data where other data recovery companies failed. So if your Memory Stick, Memory Stick Pro, HG, Duo and Memory Stick Micro (M2) cannot be recognized or mounted on your camera, camcorder, PSPs (Play Station Portable) or mobile phone, don’t panic. Most likely, your documents, photos, videos and other types of information can be recovered. Our highly trained Memory Stick data recovery team has 10+ years of hands on experience in dealing with many device failures issues. We will provide you with the best possible assistance. Get FREE Data Recovery Diagnosis for your memory Card or flash drive now!